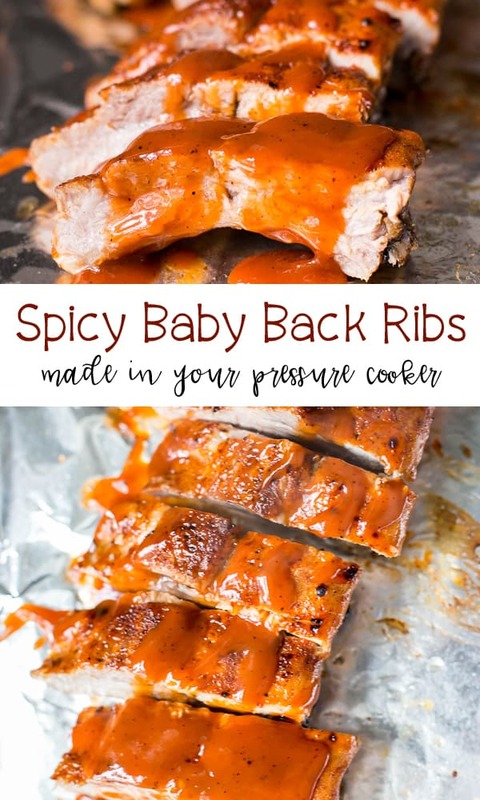 We are rib lovers and these Pressure Cooker Spicy Ribs make homemade ribs an easy task. 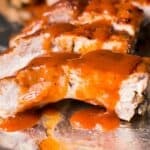 I typically will cook my ribs, low and slow in the oven, or I’ll even boil beef ribs. But since I got my pressure cooker I’ve found a faster way to make ribs. For this recipe, I used baby back ribs. Now if you’ve never used a pressure cooker or have been on the fence about purchasing one… let me tell you why I love it. I was on the fence about purchasing a pressure cooker for a couple of years. I’m not one of those jump-on-the-band-wagon types. I’d rather wait and see if something lives up to it’s hype. Sure enough, the new insta pot/pressure cookers did. They have become very reasonably priced now too. Here’s my main reason’s I love it. Pressure Cookers really are super versatile. The first step is prepping the ribs and getting the rub on the ribs. If your ribs have a membrane on the back, you’ll want to remove it. Mine did not, thankfully. If yours does, you’ll want to use a sharp knife to get under it. Loosen enough so that you can grip the membrane. The easiest way to remove it once a little bit is loosened is to grab it with a paper towel and pull it off. Next, I will rinse off the ribs and pat them dry. Now it’s rub time! I used my daughter’s Spicy Rib recipe. She’s 13 and loves all things spicy. We love putting this rub on chicken thighs, but I thought… let’s try it on some ribs. Sprinkle both sides generously with the rub. You’ll want to wrap the ribs and let them sit in the refrigerator for at least 12 hours. I typically will put them in the night before and let them sit a good 18 hours. 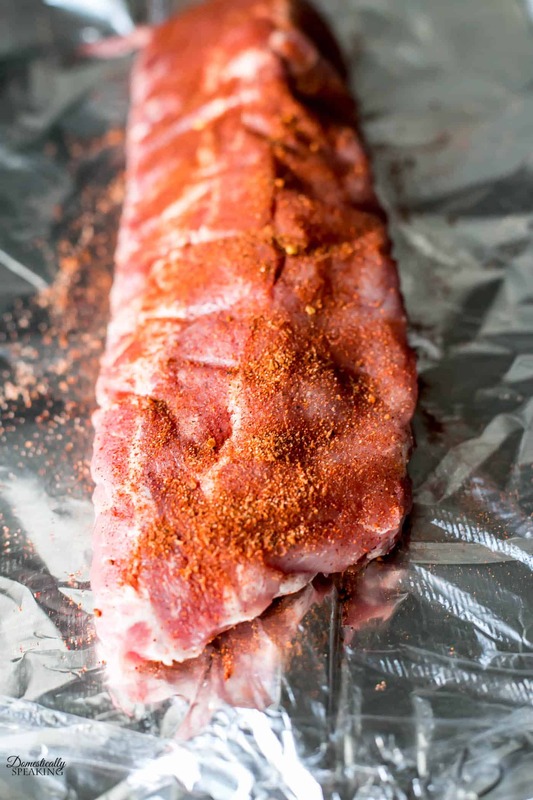 I find laying our a couple sheets of aluminum foil and then placing a couple strips of plastic wrap on top; then I will lay the rack of ribs on top and wrap it all up. After your ribs have sat for a good 12 hours they are ready for the pressure cooker. The meat has absorbed some of that rub and those ribs are looking happy and ready for the pressure cooker. Place the metal trivet to the base of the pressure cooker liner. Add the liquids to the bottom. Place the ribs with the meaty side facing outward on top of the trivet. Follow the directions on placing the lid on your pressure cooker / instapot. If you have a meat setting, use that. After letting the pressure naturally go down for 15 minutes I pull out the ribs and place them on a foil-lined back sheet. Then it’s time to slather them with our favorite bbq sauce! About 5-7 minutes in the broiler to brown them up and they are ready to serve. 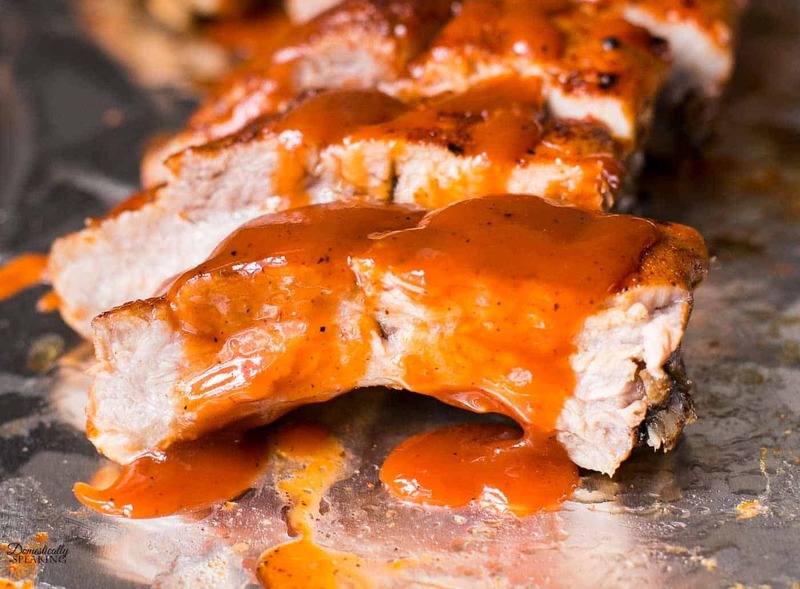 Spicy Ribs cooked in the pressure cooker is the easy way to enjoy this delicious recipe. Coat your ribs with a generous sprinkling of the spicy rub mixture. 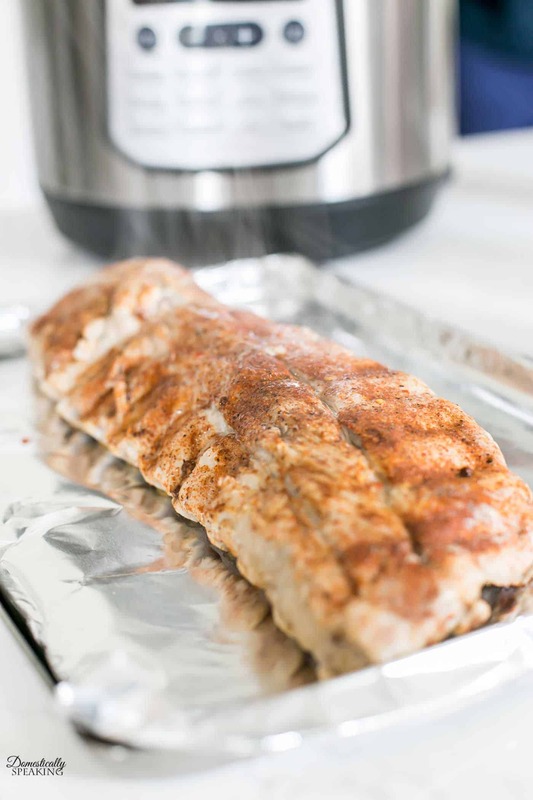 Wrap the ribs and let them rest in the refrigerator for a least 12 hours. 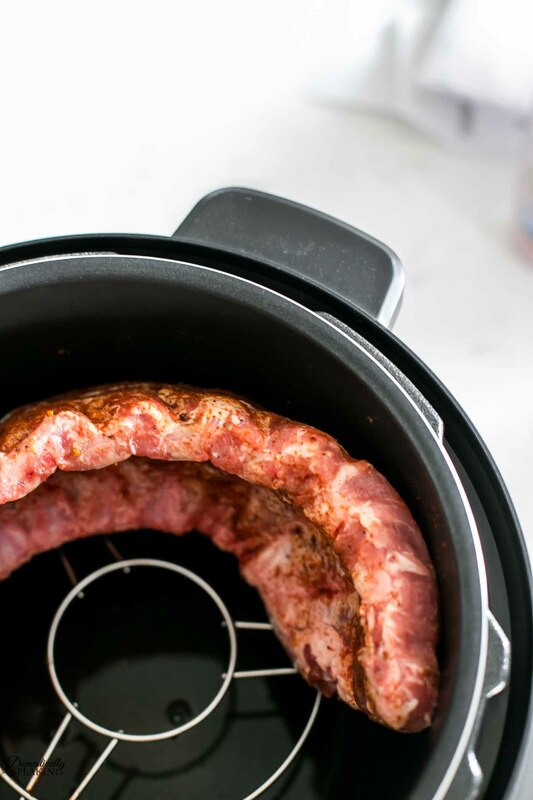 After 12+ hours unwrap your ribs and place them in your pressure cooker on top of the metal trivet. Place the ribs with the meat side facing outwards. The ribs should curl the shape of the pressure cooker. If you need to, cut a long rack into 2 pieces. Pour the water and liquid smoke into the bottom of the pressure cooker liner. Place the lid on the pressure cooker and make sure it's sealed properly. Select the MEAT setting. If you don't have a meat setting you can use manual. Once pressure cooker finishes, allow the steam to naturally release for 15 minutes. After 15 minutes, use a wooden spoon to release the pressure value. 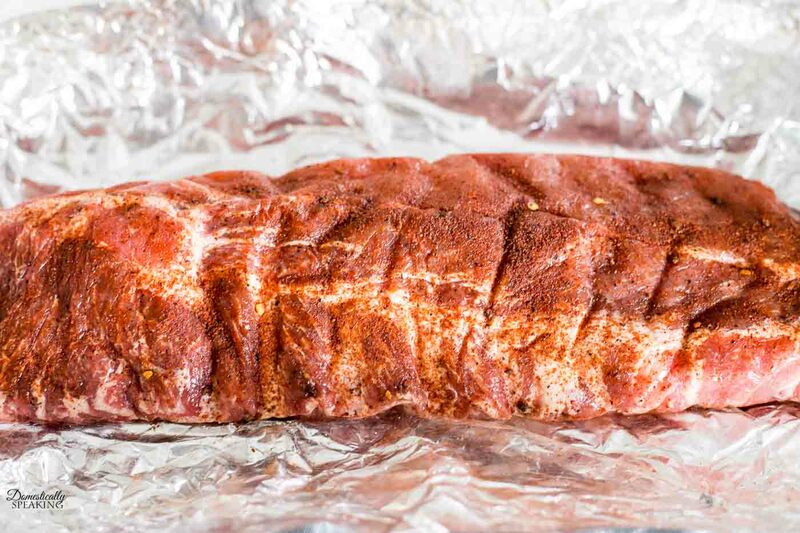 Place the ribs on a foil-lined baking sheet and slather with your favorite BBQ sauce. Place the ribs under the broiler for 5-10 minutes, until just browning. Remove from the broiler and slice and serve. I hope your family loves this spicy rib recipe as much as the heat-lovers in my home did.